The three simple, almost starkly working-class issues of Measure followed glorious and overlooked “underground” poet John Wieners from Black Mountain College home to Boston, across country to San Francisco (issue 2), and back to Boston again. In his years in San Francisco, from 1958 to 1960, Wieners attended (sometimes serving as host at his Scott Street apartment) the legendary Sunday afternoon poetry workshops of the charismatic poets Robert Duncan and Jack Spicer (editor of J). Also present at the workshops were poets George Stanley (editor of Open Space), Harold Dull, Robin Blaser (The Pacific Nation), and many others (including visitors such as Stephen Spender, teaching at Berkeley in 1959). These workshops were an outgrowth of the 1957 series sponsored by the Poetry Center at San Francisco State and held in a public room at the San Francisco Public Library. 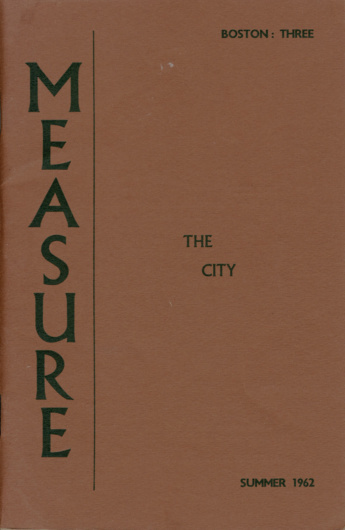 Measure 3, published in Boston, included West Coast poets Helen Adam, Madeline Gleason, Robert Duncan, Philip Lamantia, and Jack Spicer, as well as Charles Olson, Larry Eigner, and James Schuyler from the East Coast. Except for Adam and Gleason, all had also appeared in the first Boston issue.